Hello.I've been using osTicket v1.9.14 with PHP 5.4.45 for some months. I installed the software on a Cpanel account and works fine. Now I need to migrate that installation to another hosting server (Cpanel account). So I restored a backup of the files and database on the new account and updated the mysql connection parameters (username, database name and password) on the file ost-config.php. 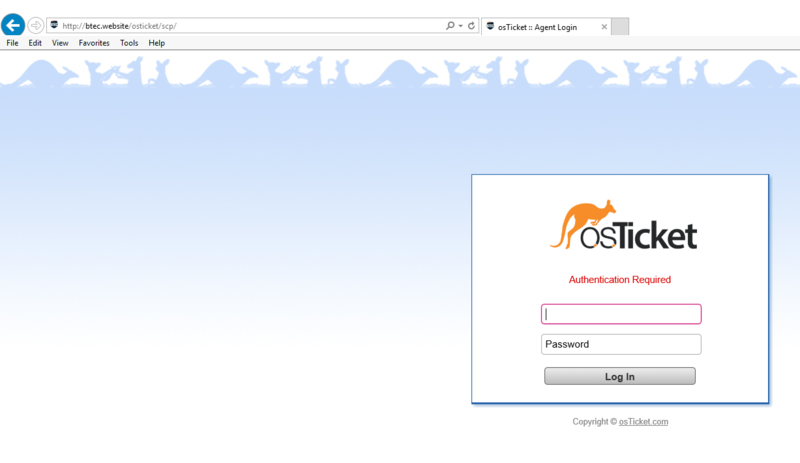 When I try to reach osticket through browser I get blank pages with no error messages. The version of PHP is the same in the new Cpanel and PHP error logging and displaying is enabled. I double checked the mysql user, password, permissions, etc. Any suggestions?Thanks in advance. Please help us to help you by reading and following the posting guidelines located in this thread: Please read before requesting assistance. The more information you give us the better we will be able to assist you. Thank you.That being said blank pages always indicate a PHP error, so you should check your logs. Hello.osTicket and PHP versions are mentioned in my post. There are no error messages and nothing in the logs. Cut and pasted from the link I sent you:Also it will assist those you are requesting help from if you can include any of the following when it is pertinent:PHP Error log entries or displayed errors. (you of course may remove any identifying information)Mail Sending: phpMail functions or SMTPMail Fetching/Receiving: IMAP or POP and Server versionPHP versionOperating SystemClient or Staff side of the UIthe location - the url or what your clicking on that is causing the problem.screen shots or mock ups showing what you are talking aboutA great way to get all the software version information is to log into your osTicket and go to Admin Panel -> Dashboard -> Information. Update: The issue seems to be related to language pack. In the original site (the one that works fine) I installed spanish translation. Now, in the migrated site, if I remove or rename the file es_ES.phar from directory i18n osTicket GUI is loaded normally (in english, of course). I confirmed that PHP phar extension is enabled in the new Cpanel account.Thanks in advance for your suggestions. So you are all set then? I need osTicket translated to spanish. So, no, the issue is not resolved since I get blank pages if the phar file is present in the i18n directory. So once you answer more of the questions that you were asked, and provide the information you were asked to provide I am sure that someone will assist you. Javerleo, are you not reading anything ntozier is asking you? I do not see what version or type of web server, I do not see what version or type of your database, I do not see any indication about your logs whether you have any or not. So this issue is not resolved because you are not providing enough detail for someone to help. Please read the link ntozier sent originally (2nd post), let us know the details we need and provide any errors (If any) that you may have. Ok people, so you don't have a clue about this issue and rather keep asking info that I already provided (I wonder if you even read the post at all). I really want to see you here posting valuable answers instead.Again:osTicket v1.9.14PHP 5.4.45No entries in the PHP log. Nothing displayed on blank pages.Problem is NOT related to mailCentOS 7Client and Staff sides are not workingThe URL: http://btec.website/osticketScreenshot not needed. Just imagine a blank page on any browser. The link works for me. Not sure what you have an issue with. Here is what I am seeing from multiple browsers.Clear your temp internet files, run disk clean up, maybe even sfc /scannow in a elevated command prompt. Unless I am understanding this wrong, it seems like it's an issue on your local machine.Use a cellphone and access your installation, see if it works. Thanks for your answer Synt4xError .It works for you because your browser language is english. In my case is spanish, so I still get blank pages.I tested from several locations with a clean browser cache. The problem arises when spanish language is selected by browser setting or forced for a certain user. Ok let me ask these two things then;1) Have you updated the language pack with the new one on the website? The dates for release may be incorrect, but I believe the language packs were updated for v1.10 a month or so ago.2) Does your spanish/english option happen at browser level or the OSTicket admin panel? So if i create a ticket and change my language in your system (OSTicket) to spanish, my pages will be white? Hello Synt4xError.I use the same language file that works fine in the original osTicket installation. Note that the osTicket version is 1.9.14.When I use a browser with english locale setting, the UI loads fine at the begining (in english). Now, if I login in with a user that has spanish as preferred language the pages go blank again.I'm thinking the problem is related to phar files handling in the new hosting environment. I see phar support enabled in the new Cpanel. I don't know how to further troubleshoot phar functionality.Thanks. hello guys, i think i know whats the problem is, its because server support to .phar language that caused white blank page. so, is it hosting problems? You appear to be using a custom mod called a 3rd party theme. Please remove it and try again. Lastly, please do not be a necromancer. If you have a problem start your own thread, not animate one that is 2 years old. Killing zombie thread with a head shot.